THE Rajasthan government distributed hybrid maize seeds not suitable for agroclimatic conditions of the state to over 750,000 farmers. In doing so, it overlooked the recommendations of the Union ministry for agriculture and the Indian Council for Agricultural Research (ICAR). The seeds had failed to give desired yields during trials conducted by ICAR and were not notified by the agriculture ministry for the state. 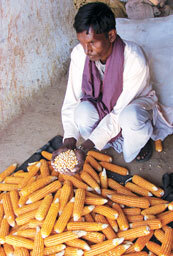 The seeds proved lucky this time and there was good yield of maize, thanks to heavy rains in the state. But officials with the agricuture department warn the experiment would have turned “disastrous” had it been a drought-hit year. The hybrid maize seeds, Prabal and DKC7074, belong to Monsanto India Limited, a subsidiary of Monsanto, USA. 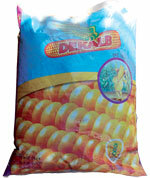 The company produces the seeds under brand name Dekalb. The seeds were distributed to tribals and BPL farmers in Udaipur, Banswara, Dungarpur, Pratapgarh and Sirohi during the Kharif season (June-October) last year. The packets weighing five kg were given free of cost under a project Golden Rays, a collaboration of the state government and Monsanto. About Rs 39 crore were spent on the seeds and Rs 15 crore on fertilisers using grants from Centresponsored Rashtriya Krishi Vikas Yojana. The varieties are mainly used for corn oil, starch and other products. “Prabal variety has been notified for Maharashtra, Andhra Pradesh, Tamil Nadu and Karnataka,” said Jyoti Kaul, senior scientist (plant breeding) with Directorate of Maize Research, Delhi. ICAR has recommended another variety DKC7074R for Rajasthan, but no trials have been conducted on DKC7074, she added. The recommendations are made after three years of research under All-India Coordinated Research Projects. Under the projects seeds are distributed to various agricultural universities and government research institutes for field trials. Observations are made on various parameters like yields, water requirement and pest infestation. Reports are then presented before a committee which decides on the suitability of the seeds for various regions. “ICAR gives recommendations after studying pros and cons. It is amazing that the state government just ignored them. What was such a dire need to buy a truthful seed (self certified by the company promising specific yields) not recommended for the region?” asked G V Ramanjaneyulu, former ICAR scientist and executive director of Centre for Sustainable Agriculture, a non-profit working for farmers. Sources in the state agriculture department said the decision to distribute Monsanto’s seed was taken at higher levels and no consultations were held with officials working at the grassroots level. “We were just sent directions and asked to help the company people,” said an agriculture officer. The officer added that there were many complaints from the five districts about the seeds of DKC7074, an early maturing variety. “The cob size was more than usual in some cases leading to fewer kernels,” the officer said. Government’s defence G S Ametha, zonal director, agriculture research station, Banswara, defended the decision of the government. “Though field trials of the two varieties were not conducted, field demonstrations were held. They gave promising results based on which the varieties were promoted,” he said. Rajasthan agriculture commissioner J C Mohanty said they took their cue from Gujarat to introduce the seeds. “Some areas in Gujarat have similar climate like Rajasthan. The variety has done very well there, though it was not notified by the agriculture ministry for the state. So we decided to adopt it,” Mohanty added. We are (Budget Analysis Rajasthan Centre Jaipur) also doing a research survey on distribution of seeds by MNCs in tribal area of Rajasthan. Soon we share the result of this study. Down To Earth should investigate whether one Dr Shanti Lal Mehta (ex-DDG, Education, ICAR, and later Vice-Chancellor of the Maharana Pratap University of Agriculture and Technology, Rajasthan), and his brother M L Mehta (ex-Chief Secretary, Rajasthan government) are Monsanto's lobbysts. There were serious allegations (vide report of the ICAR Inquiry Committee headed by Dr PB Gajendragadkar, 1973), that Dr SL Mehta's Ph.D thesis was based on fabricated data. Later, when he was DDG, ICAR, there was a CBI inquiry against him in the matter of procurement of computers and IT equipment. He could get out of both situations with help from politicians arranged by his brother. Besides, you can also contact me on mobile 09999689506 any time.